Marmite is a British savoury spread made from yeast extract, a by-product of beer brewing. It is a sticky, brown paste with a distinctive, powerful taste that polarises consumer opinion. This is reflected in the company's marketing slogan: "Love it or hate it". 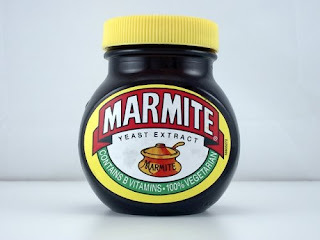 The image on the front of the British jar shows a marmite (French, "large covered earthenware or metal cooking pot").Marmite was originally supplied in earthenware pots, but has long been sold in glass jars that approximate the shape of such pots.A thinner version in squeezable plastic jars was introduced in March 2006 and the help promote this Marmart was created. Those of you that have never experienced this dark matter need to know that the gastronomic challenge it presents has divided familys, friends and the happiest of work places. Whilst there are plenty of critics there are those who love it with a passion. Marmite is a magnificent substance, best served on toast but can add that certain something to most meals. However, I advise caution and ask people to be sensitive to those don't like the stuff as they may be the ones who control the food order! Mark, many thanks for highlighting the seriousness of Marmite induced workplace conflict, which in my experience can be (almost) as unpleasant as Marmite itself. By the way, power may corrupt, but I think if Marmite was left out of the food order I might have a mutiny on my hands!